We know that everyone in East Peoria is looking forward to the Red, White, and Boom celebration down on the riverfront July 4th. East Peoria Green Asks that everyone would try to do your part to keep our city and nation beautiful by putting trash in the garbage cans and putting recyclable items in the recycling toters. Please pour out any left over water or soda from their containers and leave the cap off the bottles. If there is no room left in a recycle toter please place plastic bottles, cans, and plastic cups next to a recycling bin. East Peoria Green will be down on the East Peoria River Front at 6 a.m. on July 5th. We will be picking up any extra garbage or recyclables that do not get put into the proper receptacle. We will be placing the toters where the East Peoria Garbage and Recycling workers can get it into their trucks. 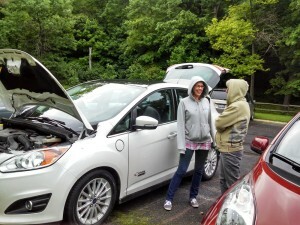 Electric Vehicle Day was an interesting event. If you missed the event on May 20th you missed some great information on electric cars. 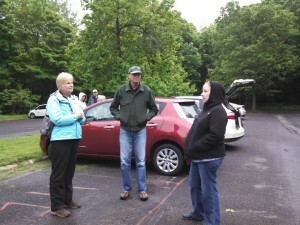 There were 5 different types of electric vehicles at the HOI Sierra meeting at Forest Park Nature Center. 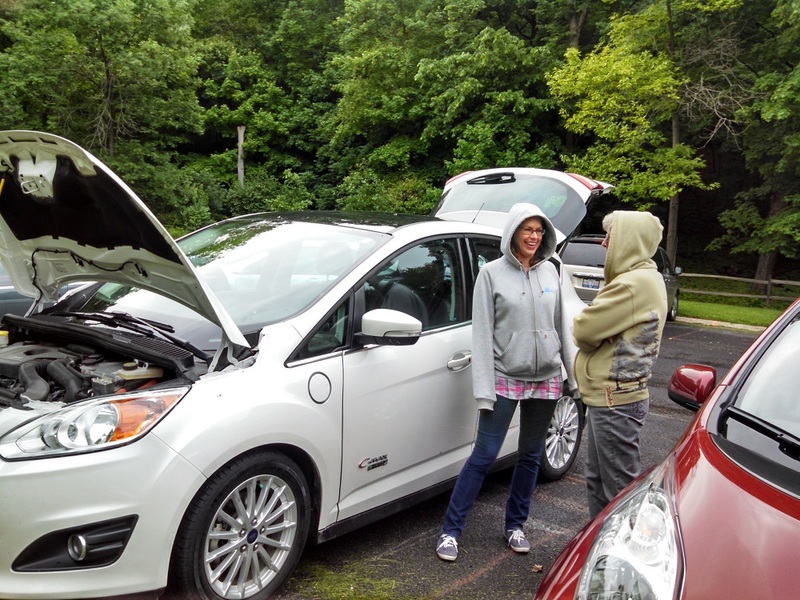 We had owners bring in their Leaf’s, Ford C-Max, Mitsubishi, and two Volts. The Volts were brought in by East Peoria Green members Bob Jorgensen and Martin Hobbs. Those who attended had the chance to ask questions, sit in the vehicles and get a feel for them and even go for a test drive. 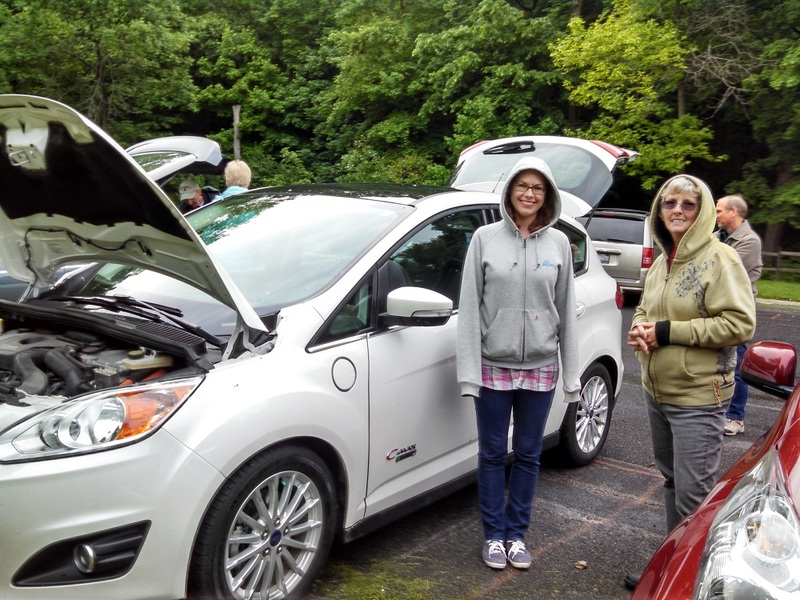 East Peoria Green member, Lori Wolf, drove 3 of the five different EV’s. After the hands on examinations in the parking lot we all went to the HOI Sierra meeting. Each driver spoke for between 5 and 10 minutes about the positives and negatives of their EV’s. By the time the evening was over we all had learned a great deal about EV’s in general and the specific characteristics of five types of electric vehicles. If you are interested in learning about EV’s contact Bob Jorgensen. Rocky Glen is Peoria’s newest park, a natural area with unique geological beauty, a fascinating human history, and a very special combination of plant communities. 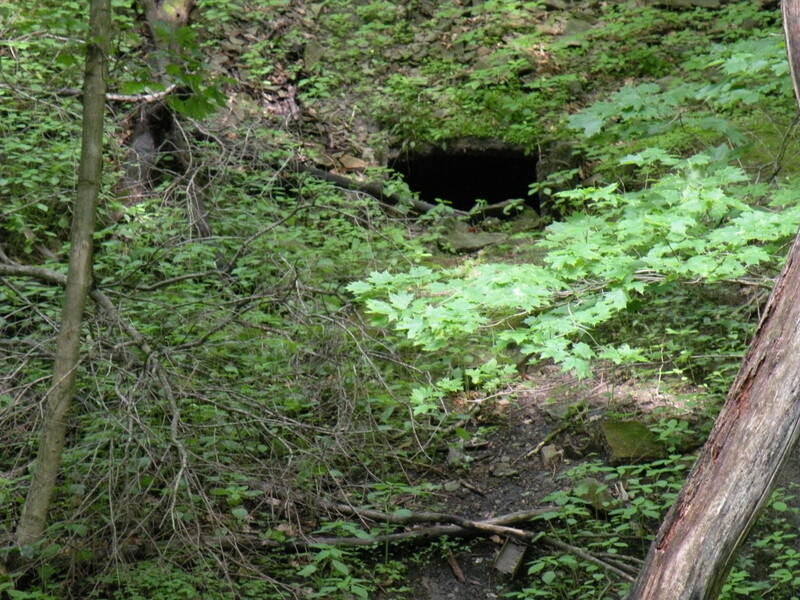 A non-profit group, Friends of Rocky Glen (FORG), mantains a website and offers free guided tours every month to showcase this truly awesome park. 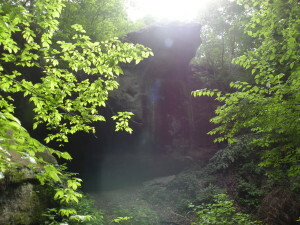 Visit www.friendsofrockyglen.org, for lots of pictures, information and a full calendar listing of the hikes and what to wear. 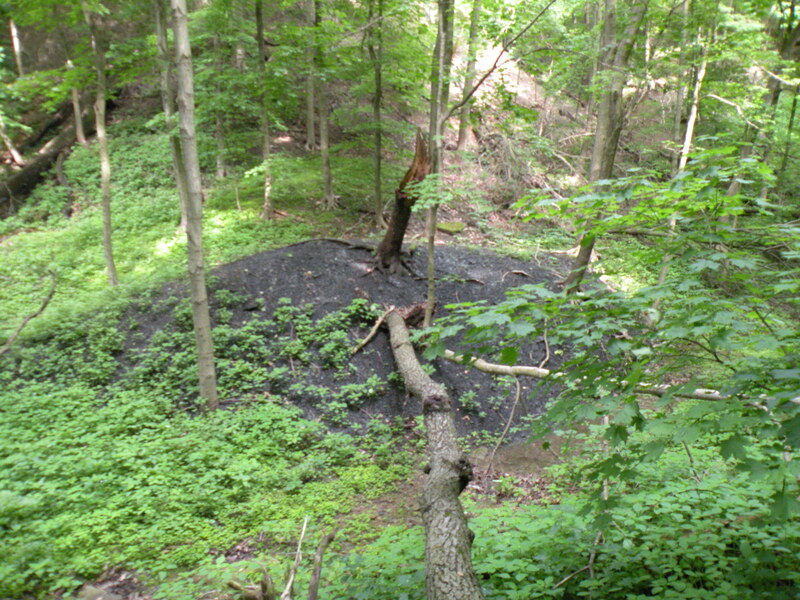 This is a moderately strenuous hike that can be done by anyone who can walk the total distance of about 1 mile. 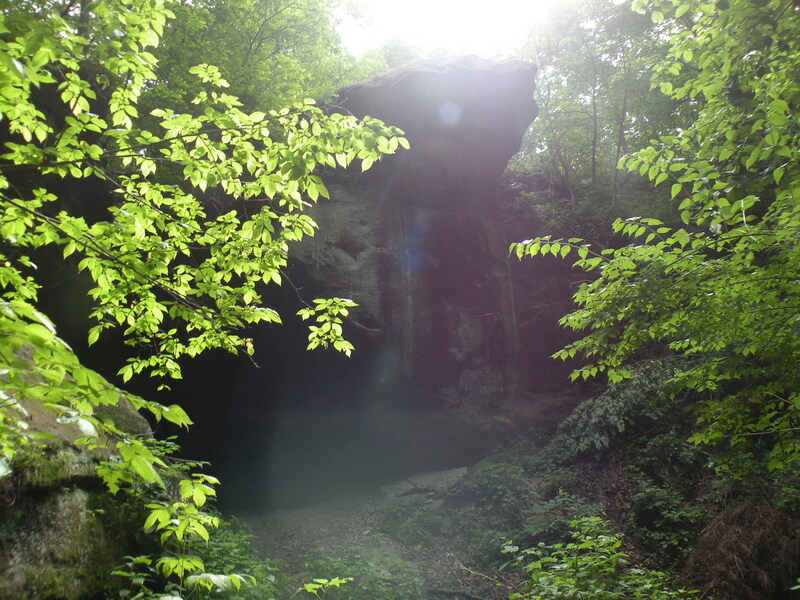 The story of the people of Rocky Glen includes the hundreds of carvings on the soft sandstone walls. The oldest carved date is 1880, the youngest markings are not carvings at all but spray paint from young picnic fools. 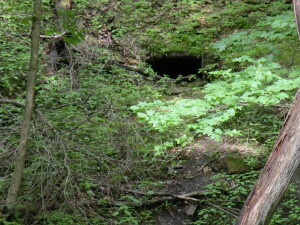 Coal mining first brought the European people to Kickapoo Creek, and the now abandoned coal mine entrance that hikers pass enroute to the spectacular box canyon once connected over 50 miles of underground tunnel, all four feet high following the Pennsylvania coal seam. 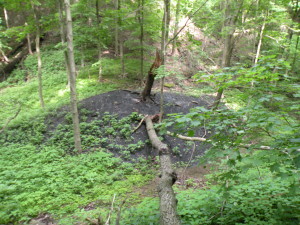 I highly recommend the hike and suggest you look at the website for more information and a possible guided tour.